Some of the most popular resolutions are: spending more time with family, to quit smoking, lose weight, get out debt, enjoy life more, quit drinking, more health and fitness, etc. What we were really expecting to happen is when we see saw the time of 12:01am on January 1, 2014, we were expecting a miraculous switch to occur just by the tick of a clock. Really? When you made a resolution, did you create a how-to plan? If you didn’t you only made a how-not-to plan by default in doing nothing. How is anything accomplished without a plan? Honestly, our “Will”, generally, is not strong enough. If so, we would not over eat, or we would make a routine of working out, we would stick to the plan until the end, or hang in there and work that relationship until we both are exhausted. We would not have to make any resolution about embracing life more, or spending more quality time with family. Doing it would simply— be it. We don’t say we are going to do anything, we just do. Our mind, which is more powerful than we know and even care to use, barely using only 10% of it, has a way of creating a unity of body and spirit, which causes a line up like soldiers with pure adherence to the will of the mind. Any Olympian trainer will tell you that the success of the athlete relies on the athlete’s best mental game. (Emotional Intelligence, Daniel Goldman XIV) In order to be prepared Olympic champions prepare. Working out everyday and using the necessary disciplines to working the body is not because they are simply talking about doing it. They are doing it. The goal is ONLY met when the mind is set. I was in conversation with a sergeant in the army. He was telling me about a drill where he had to run for hours, and even though he can do 1000 push ups daily, his body almost shut down during a very strenuous and dangerous drill. He knew he had to keep running, but his body was beginning to shut down due to exhaustion. His mind was the key. Once his mind sensed the danger involved in not continuing to run, his mind became the driver and the body obeyed— until he reached safety, after which his body did a complete shut down. 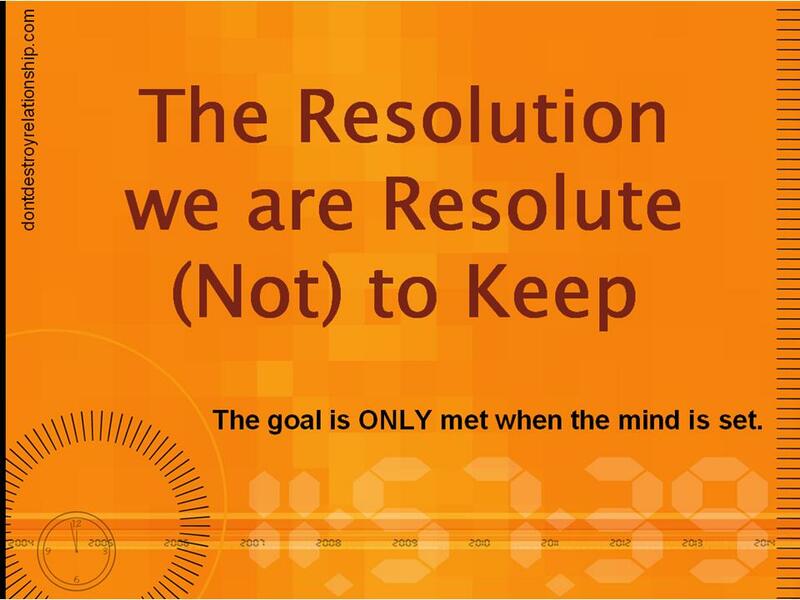 A resolution is much more than mere empty words. It is about a goal to be strategized and met daily. Goals by athletes, champions, and olympians is an extreme fixation on the prize. Out with the resolutions and in with the goals. After all, do our athletes make resolutions to play a better game? One game lost and the immediate focus is the mistakes made and the necessary counter strategies to win the next one. The same could apply to us. How about the failing relationship? What is the next necessary strategy? Working on a goal, makes one think logically and forces strategy. What a winning combination! Every day is the day to reach the goal. The goal can be getting that job you want. Stashing your cash. Building the business. Getting an “A” in school. Maybe the goal could be about taking your life to the next level. Or making your relationship stronger, removing the pettiness, the dishonesty, and really strengthening your game as two people making the relationship work as a unit. It truly comes down to the daily task and a strategy for the win. This entry was posted in Live and tagged become a stronger person, being committed to the goal, focus on the goal, make relationship better, new year's resolutions. Bookmark the permalink.